From the land of the Glock, these pants "just work" and work... and keep on working. In fact, the co-founder of KommandoStore (pictured) wore his pair daily for a multi-year period between late 2015 and early 2018. Now you might be saying "that's a little autistic Ivan" and you would be right — but no one has ever faulted autistic people for a lack of attention to detail now, have they? Manufactured as part of the Austrian BDU system, the M75 pants are made from the same fabric compositions commonly found in Austrian BDU shirts. This batch seems to be evenly split between a 50/50 cotton nylon blend and a 67/33 nylon rayon blend. Both are equally durable — your choice really comes down to fabric weight and your personal preference. The 50/50 blended pants are slightly heavier and have a more muted "stonewashed" appearance. By contrast, the 67/37 M75s are a more vibrant green color and are slightly thinner due to the compact synthetic fibers. Whichever blend you choose, rest assured you are buying quality. These pants have proved extremely durable for generations of Austrian conscripts and are plenty sturdy for the rest of us. They are lightweight, comfortable, and good for warm, cold, and any other temperature in between. Dirt, scrapes, and scuffs that would destroy your jeans are laughed at mockingly in Austrian — what’s that? Oh, our intern is telling us that “Austrian” isn’t a language. Fine. Just imagine Arnold Schwarzenegger giving a full-muscled belly chuckle then. From your pants. Comes with two spacious cargo pockets and literally the best front pockets we've ever seen on a pair of pants. Seven wide 1.3" belt loops. Classic five-button fly, just like your favorite raw denim jeans. With enough use these pants will break in like your favorite jeans too. These pants have been vetted for holes, tears, and stains. Only reason I didn't give it five stars is because there was a small speck of paint just below the right front pocket, a slight wear mark caused by the belt on the fly and I had to sew a couple of fly buttons on tighter or they would have come off thru use. However none of these issues were enough to compromise the useability of the item. And also not bad for a pair of surplus pants. They just barely fall short of five stars because of these three issues. Otherwise they'd be five star. These pants are a lighter material than the other 50/50 cotton polyester mix pair that I have. Maybe for summer use? At any rate. Very happy with them. And highly recommended. - Peter. I got these for their visual appeal and to shake up my typical routine of wearing jeans pretty much everywhere. I was surprised twice: once by how well they fit and again by how comfortable they were. 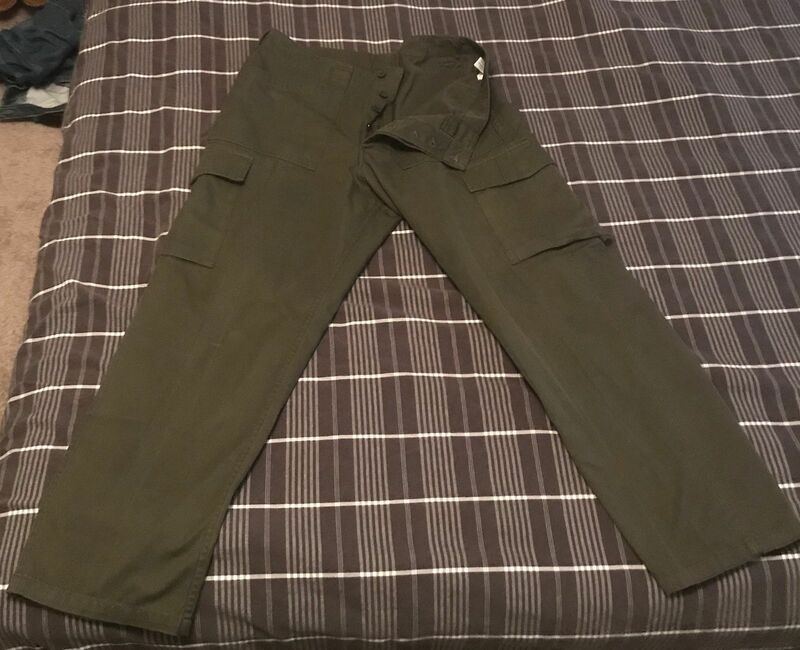 My experience with some of my other milspec pants has been functional but not overly pleasant. I could wear these all day long and still be happy at the end of it. For reference, I'm a big guy (not Bane but certainly getting there), and yet these still fit well. Highly recommend! Just wish they'd restock the light M75 shirts to pair with this! Great pants, should survive in and out of the woods. Feels tough, enough slack to be comfy. Came with a small hole in the crotch for extra mobility - should be easy to fix up though. The waiste and length are great, but they are a little tight in the thighs and seat. Maybe it is because Europeans have bird legs. Dont expect them to fit like US BDU. No signs of serious wear.